Quake® Champions Official Website | Save big during Quake Champions’ Black Friday Sale! Stay frugal while you frag this month with a limited-time sale in the Quake Store! 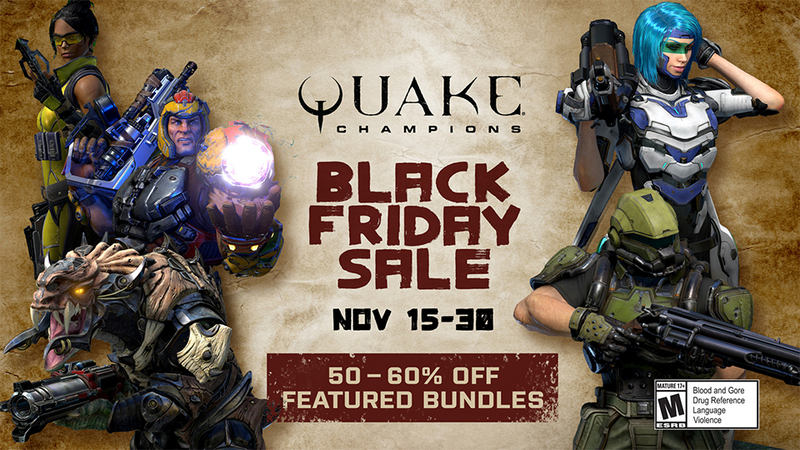 From now until November 30, featured bundles for Quake Champions are discounted anywhere from 50 – 60% off. With these special sales, your Champions and weapons can look their most stylish in the Arena while saving you money! Whether you’re drawn to the classic appeal of the Doom Marine set, the spookiness of Anarki’s Bone Daddy outfit, the callback to Quake’s past with the Conductor Lightning Gun or something else entirely, act fast and grab the items you want for less before these deals exit the Dreamlands!